Sony denies rumors that its Japanese arm is forcing its decision. Seth Rogen wants to assassinate Kim Jong Un on screen in The Interview, and North Korea is predictably upset. Now Sony is considering edits for its wayward comedy, among them removal of a scene in which Kim Jong has his face melted clean off. Military buttons are also to be switched, to avoid upsetting the powers that be in Pyongyang. The buttons may be a more serious issue than the face-melting, as they depict accurate copies of those worn by North Korean soldiers. Among the decorations are badges honoring Kim Jong Un and his father which, Sony suspects, might be the real reason why North Korea threatened swift and merciless action against the United States unless The Interview was canned. If the face melting gets cut, Sony promises, it will be because it wasn't funny, and not to placate North Korea. 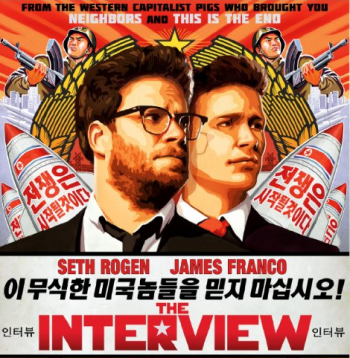 The Interview, for those of you who've been living under a rock for fear of North Korean missiles, has Rogen and James Franco, as celebrity TV journalists, travel to North Korea to interview the reclusive dictator, only to be recruited by the CIA to kill him. Rogen Tweets that he has hope Kim Jong Un appreciates his sense of humor, but so far North Korea has been unamused by The Interview. Sony has denied reports that the edits are being forced on it by its Japanese arm. Japan, it should be remembered, is a much more likely target for North Korea's wrath than the United States, assuming this ever gets to the nuclear stage.